The month of June has shaped up to be a good one. Summer is officially here, I'm heading to Napa for a wedding next month, and my brother got married. Peaches and apricots are at the market! There's also been a slew of great reads on the web, and here are some of my favorites. Also, scroll down for a special announcement! Jhumpa Lahiri has a new novel coming out! I can hardly contain myself. Read an excerpt here. Mung beans are having a moment. Literary Jutebox, Great Gatsby edition. Surround yourself with other people's creativity, plus more wisdom from James Cameron. "I wanted to always be lost inside a good story, and spend my life there." 7 Tips for bringing mindfulness to your workday. Sara shares her healthy eating philosophy over at A Couple Cooks. It's a great time to revisit this simple cooking technique. 13 Favorite Food Poems, curated by Saveur. Scientific proof that reading is good for you. A blog about one thing: salad! "Call it grazing, or default dinner, or parenting by tapas — we’re happier, calmer and probably better fed." Here are the top 10 apps for writers. 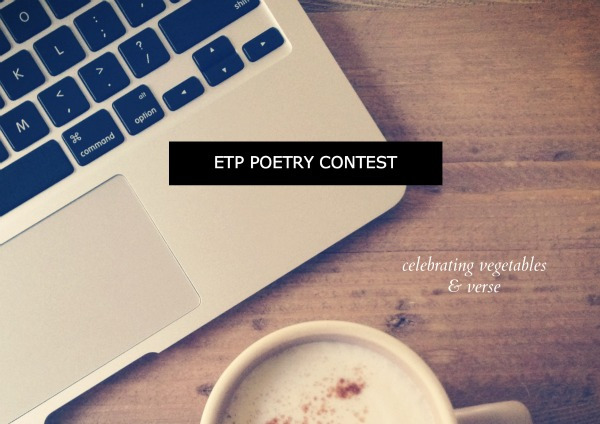 Announcing the ETP Poetry Contest! This summer, writers are invited to submit their food poems to Eat This Poem's inaugural poetry contest! Submissions will be open from July 1 - August 15, 2013, so get out your pots and pens. Find out more on the contest page.